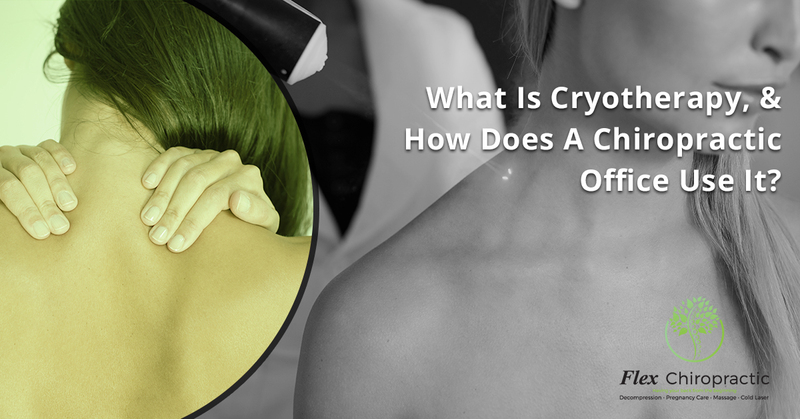 What Is Cryotherapy, and How Does A Chiropractic Office Use It? As you’ve probably noticed, many chiropractic offices are going beyond treatments that would have been found in clinics of the past. While chiropractic started out as simply adjustments, modern offices will offer a large variety of treatments such as kinesiology taping, ultrasounds, cold-laser therapy, massage, and electrical stimulation. Today we’re going to talk about another way that we can help our patients: cryotherapy. When we offer cryotherapy to our patients, they are often unsure of what we’re talking about. That’s because, while the effects of cold as a way of treating the human body have been known for a long time, it’s just recently made its way into chiropractic practices. Let’s take a look at how it works and how it might be able to make you feel better. If you’ve ever used an ice pack to reduce swelling to a sore muscle, or put a cold washcloth on your forehead in order to cool down, you’ve experienced the benefits of cold used to make the body feel better. In short, it’s any form of body cooling for therapeutic purposes. Clinical cryotherapy goes well beyond cold compresses, though, and uses special equipment to cool specific parts of the body. The second type is a whole-body cryotherapy chamber, which is large enough for a person to step into. Cryotherapy has three very distinct ways in which it can help those who visit a chiropractic office. The body redirects blood flow to areas of the body that are cold. Using cryotherapy to cool parts of the body ensure that blood (including the oxygen and nutrients it carries) is directed to the parts of the body that are coldest. Is Cryotherapy Right For You? Cryotherapy might sound uncomfortable at first, but most patients actually feel very invigorated by it. Still, it’s not for everyone, as the invigoration it offers can affect those with certain medical conditions. Before we offer it as an option for you, we’ll be sure to ask you about your medical history. We’ve seen some excellent benefits for those who have sought cryotherapy out, and we’d love to talk to you about how it might help. Whether you’ve recently experienced an injury or are simply looking to increase blood flow to painful areas, we’re ready to discuss this wonderful treatment. Contact your local chiropractor in Columbia or Lexington and discover the benefits of cryotherapy!